One of the most iconic automobiles to come from Detroit is the Chevrolet Camaro. In its first incarnation in the 1960s it, along with the Ford Mustang, introduced “pony car” or “muscle car” to the lexicon of automobile enthusiasts worldwide. Due to issues concerning fuel economy and the impact of CO2 to the environment, Chevrolet discontinued the legend in 2002, in its fourth generation of production. The automaker reintroduced it in the 2010 model year as the belated fifth generation of the car. Although there was an eight-year hiatus of production of the Camaro for public sale, Chevrolet recognized the continued popularity of the car and issued a series of Camaro concept cars in 2006, 2007, 2008, 2009, and 2010. However, it was the fifth generation Camaro that started production for the 2010 model year and ran through the 2015 model year that gave the chance to regular consumers to once again get behind the steering wheel of the long-timed delayed Camaro. It should be to no one’s surprise that the owner of an iconic fifth generation Camaro would want to squeeze out even more high performance than the stock Camaros produce. Still, many of them are not yet ready to spend the money for high-performance add-ons. That’s where the AIRAID 250-714 Jr. Kit comes in for the 2011-2015 6.2L Camaro. 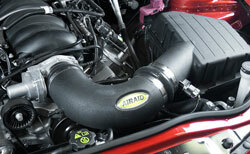 The air intake offers a Camaro owner the chance to step up to an entry-level economic high-performance product. The kit includes the AIRAID 850-427 washable and reusable replacement air filter that features a multilayered cotton gauze media that is specially treated with a special grade of oil. The oil makes the strands of the filter very sticky so that they can capture and hold contaminants. The AIRAID 250-714 Jr. Kit is designed to replace the factory air intake system and air filter. 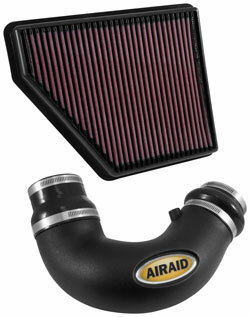 AIRAID also offers air filter cleaning kits that are specially formulated to cleanse and recharge the air filter so it can be used over and over again. In fact, the air filter will last for the life of the car. The Jr. Kit also features a modular polyethylene air intake tube that is designed to straighten the airflow to assure a better route to the engine than the factory air intake system. This is designed to help boost horsepower, torque, acceleration, and throttle response. The kit is designed to replace the factory air intake system, intake tube, and paper air filter while the stock air box is retained. It can be installed without drilling holes with common hand tools. AIRAID is so sure of the quality of the kit that it offers a no hassle lifetime warranty.